for a variety of aches and injuries in the lower leg region. Some estimates put it as high as 31 conditions. While it is true that shin splint injuries occur mostly to athletes and those who often run or walk long distances, in my career I have seen the injury occur in football lineman and baseball center fielders that do not necessarily run long distances. I have also heard that changing surfaces, i.e. soccer players going into basketball season, may precipitate the muscle inflammation we call shin splints. But I wonder, if that is the case, why then doesn’t every one of my soccer athletes turned basketball athletes get them? Obviously there must be something different about different athletes. I have found two predominant conditions that often lead to shin splints: foot/gait patterns of over pronation and tight heel cord muscles. With ankle over pronation (rolling inward), the entire structure from ankle to hip/low back operates at a less than peak efficiency. When muscles chronically work at less than their optimum angle, stress (inflammation) occurs. Secondly, heel cord muscles (gastrocnemius or the calf and the soleus muscle) are critical to smooth propulsion in the walking and running cycle. Calf tightness causes premature heel raising which redistributes body weight along the bottom of the foot and alters muscle contraction timing. Any change that alters what the body perceives as its optimum performance range (which is a floating definition based upon age, genetics, level of conditioning, etc.) will result in breakdown or at the least inflammation and pain. 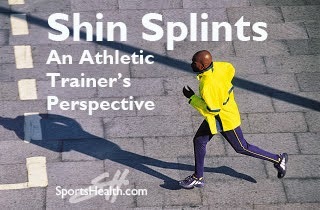 Since shin splints may represent a variety of ailments, there are likewise a variety of ways to treat the injury. Remember the adage "everything in moderation" so ease into any changes in your exercise routine and as always when it doubt, see a professional. Working though the discomfort must be tempered with common sense. "It hurts when I do this", then "don’t do that!" Ice has an inflammation reducing capability. Remember that muscles that are angry with you with become inflamed. Inflammation causes pain, which causes inflammation, which causes pain...you get the idea. Sore muscles supported with elastic wraps, tape or neoprene sleeves often feel better. These products can hold in body heat which has relaxing (increased blood flow) results for sore muscles due to greater oxygen delivery. The age of the athlete in front of me determines what I say about the use of aspirin or ibuprofen. Typically state laws prohibit medication dispensing in high schools and aspirin is not advised for children. Adolescents must be told "whatever your parents want to give you" while college and professional athletes can make their own decision but should be reminded not to overdo it in an attempt to mask the discomfort. In the case of an overpronator, arch supports may produce some relief, if not, prescription orthotics may be needed. For some it may be as simple as checking the insole in the shoe. Through wear, age and sweat the softness afforded by the insole may become compromised and is resulting in excessive force being transmitted up through the foot-ankle-shin. Use cross training whenever possible to focus on different muscles, different distances and different intensities in order to "rest" the sore shins. Swimming and bicycling are good sore shin alternatives. Take this time to focus on your core strength and overall flexibility. General warm up involves overall blood flow increase while specific warm up mirrors the demands of the activity. Dynamic warm up is a blending of these two by large muscles movements related to the activity. Warm muscles move better and are less likely to be injured. When you are done, do some simple large muscle movements on your way over to pick up the ice bag for your sore shins. Stretching with both straight and bent knees for 30 seconds each several times a day alleviates many cases of sore shins. Since the calf muscle does most of our propulsion and is more powerful than the shin, it usually wins the "argument". Once they get short and tight, the shin muscles are forced to function at a slightly altered angle and they do not like it...thus the pain. Kent Scriber, ATC Ithaca College, Ithaca, NY: Aside from the traditional care (rest, ice, stretching, and gradual return to participation), I have found that providing some sort of arch support is helpful. It seems most of these lower leg problems are triggered by some sort of biomechanical issue. Therefore taping, providing a foam or felt pad, or a more permanent orthotic often alleviates symptoms. Jennifer: Like Maria Hutsick, I have also had several athletes, predominantly female soccer players, who have had chronic exertional compartment syndrome, which can in its beginning stages mimic shin splints. Since presenting a case study at NATA in 2010 on this topic, I have had 2 additional female soccer players and 1 male soccer player with this condition. Two of the three have had to have surgery before the end of their high school careers to be able to continue playing. John: My basic thought regarding "shin splint" pain is monitoring the pain during activity and the duration of the pain after activity. Does it go away after 3, 6, 9 hrs., etc..? or does the pain linger on into the next day’s workout? Any increase in pain or duration of pain would lead me to limit the athlete’s activity and/or refer them for further evaluation/x-rays. If the athlete’s pain dissipates within a short period of time after their workout or if the athlete can start their day with pain not being any worse than the day before, I am usually comfortable allowing that athlete to continue. I also (encourage) icing, stretching both (calf muscles), checking foot biomechanics, and adding arch supports, if needed. I will take my cleated athletes (primarily screw-ins) out of their cleats for a period of time and have them workout in (athletic flats. Maria Hutsick, ATC, Medfield High School, Medfield, Ma. : Another area to look at especially in female athletes is the issue of compartment syndrome. Many girls end up with chronic pain and numbness and tingling in the lower leg/foot region. Further investigation results in symptoms such as muscle hardness in the lower leg, pain after or during exercise, and the symptoms may progress. This is usually an issue that shows up in 10th or 11th grade. By the time they get to be freshman in college they may need surgery to continue playing. I've seen arch/shin taping and arch supports work well to alleviate shin splint symptoms both as an AT student and during the time I spent working in a specialty running store. I'm currently on a rotation in a high school and I've started to re-orient my thinking about lower extremity injuries to look at the problem top-down instead of bottom up. That is, start at the top of the kinetic chain with the hips and gluteals and then down to the feet. Any thoughts on how hip/gluteal/core strength may play a role in shin splints? Hi Eileen, we apologize for the delay in getting back to you. Phil has been out of power and out of touch since Hurricane Sandy. He is working on an answer for you shortly though!